Worried About A Cavity? We’re Ready To Help! 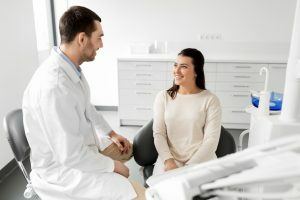 If you think you might need work done on a cavity, your goal should be to have the matter treated as soon as possible. If you delay care, you can leave yourself vulnerable to a continued attack on your tooth structure. While a cavity can start small, the problem can progress to the point where your tooth develops an infection, which requires a root canal procedure to address. Your Bellaire, TX dentist is ready to help you if you need to arrange restorative dental work. In addition to stopping and treating decay, your dentist can provide you with a natural-looking modern restoration to protect your tooth. If a cavity reaches a stage where bacteria can infiltrate your pulp, you can experience serious complications. While this is taking place, you can experience dental pain and sensitivity. If too much time passes, a cavity can leave a tooth past the point of saving. If you think you might need to have work done for a problem tooth, putting off that work can create trouble for your smile. Because a cavity can go unnoticed when it starts to form, you can be slow to realize that something is wrong. How can you avoid letting decay worsen without your notice? You should schedule regular dental exams, which lead to the periodic checking of your smile by your dentist. During these visits, you also receive important preventive care, including a thorough cleaning of your teeth, so future cavities are less likely to occur. Contemporary Dental And Orthodontics Can Treat Your Cavity! At Contemporary Dental And Orthodontics, you can look forward to dedicated smile care in a welcoming, modern environment. Our practice can ensure that a cavity is properly addressed, and that your tooth is restored with an attractive, hard to notice dental filling or crown. For more information, you can schedule a consultation by calling Contemporary Dental in Bellaire, TX, today at 713-668-9119. We are proud to welcome patients from Bellaire, Houston, West University/Southside Place, Southwest Houston, the Galleria area, and all other surrounding communities.